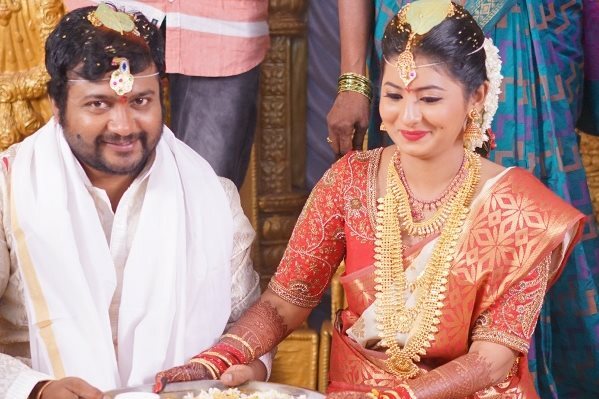 At a traditional Telugu Hindu wedding ceremony in Tirupati today (April 22), Bobby Simha tied the nuptial knot with his girlfriend and actress Reshmi Menon. While the National Award winning ‘Jigarthanda‘ actor was seen in dhoti and shirt, the bride look resplendent in red saree. They were all smiles and were congratulated by family members and close friends. After the muhurtham, Simha and Reshmi offered prayers at Lord Venkateswara temple at Tirumala, it is learnt. Recently, the couple had their Sangeet ceremony at a popular star hotel in Chennai. Later, Simha alone shook his legs for songs from ‘Jigarthanda’ and also for many Rajini songs. It was on the sets of ‘Urumeen‘ Bobby Simha and Reshmi Menon fell in love with each other. After getting the nod of their parents, they got engaged on November 8 last year.